Earlier this week we reported that the Senate GOP health “repeal without replacement” proposal would do great harm to NC, as it would double the number of uninsured in North Carolina. Unfortunately, the latest is that in a last-ditch effort to save their bill to repeal the Affordable Care Act (ACA), Senate Republican leaders are reportedly offering $200 billion to win the votes of senators from states that expanded Medicaid under the ACA. It would do nothing to address the fact that millions of lower-income marketplace consumers in non-expansion states (like North Carolina) would see their deductibles jump many thousands of dollars under the Senate bill. 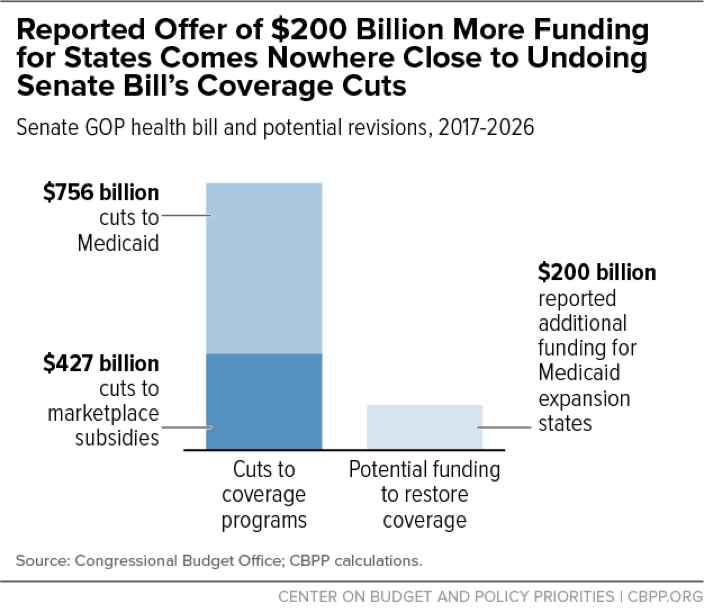 No one should be fooled: The reported $200 billion cannot fix this bill, and does not come close to undoing coverage cuts.